We are a small nursery selling predominantly hardy, herbaceous perennials many of which are unusual or hard to find. All our plants are propagated on site by us and we aim to stock as wide a range of plants as possible and therefore we only propagate small numbers of each. We are also continually increasing the choice on offer so it's always worthwhile checking in with us from time to time to see what's new. We sell at at various local events as listed on the Plant Fairs page. 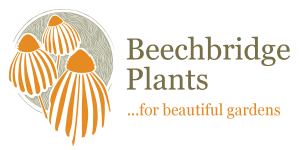 Further information about each event can be found on our facebook page (Beechbridge Plants) nearer to the time. We are always happy to take pre-orders to any of these venues for collection. We are also open by appointment onsite so if you want to come and have a look please contact us first to make sure we are in. We are situated on the B2079 between the villages of Marden & Goudhurst. We are open by appointment, give us a bell and pop round. Because we only propagate in very small batches and also due to the seasonal nature of the business it is not possible to have all of the plants on offer ready at the same time. Therefore if you are after a particular plant please contact us to check if we have it for sale at that time. We would always be happy to put one aside for you. Please Note: Cash sales only at present.